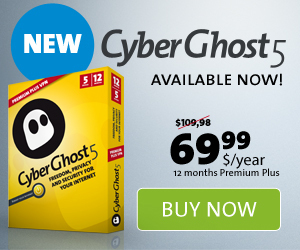 CyberGhost offers 3 pricing plans, Free, Premium and Premium Plus, and in its FAQ explains that its real aim is to provide a free VPN service, with the premium plans introduced as a way to help fund this. Users of the free plan are connected via the secure OpenVPN protocol, but only its weakest (128-bit) version. Not mentioned on the website, but when you open a new account in the VPN client you are offered a 30 day absolutely free trial of the Premium VPN service. Open VPN encryption is still 128-bit, but Premium users can also connect via PPTP and L2PT with IPSec (all also with 128-bit encryption). Direct customer support is available via a ticket system or live online chat. There is also a good FAQ area, with a useful search function which we found handy while researching this article. We also liked the fact that it is possible to rate the usefulness of each FAQ article, which should assist the CyberGhost team in making further improvements. In addition to the FAQ, there is a bulletin board which supports threads in both English and German, and while not over busy, is active. The CyberGhost website is very neatly and attractively laid out, with navigation intuitive, and information easy to find. A regularly updated blog, and fun but informative bios and photos of the CyberGhost team members, Twitter, Facebook and merchandise pages, all help give the impression that CyberGhost is a professional outfit. A nice touch is the inclusion of a free web proxy service, so that casual users can surf the web anonymously without even the need to download CyberGhost’s free VPN software. We will check this out in a bit more detail later in the review. Much easier to get excited about is that CyberGhost keep no logs. No content, visited websites, IP addresses or personal communication is kept all. Anonymous log-in records are kept for 24 hours for statistical purposes, but are deleted every day. Also, no payment account details are stored once the payment process is over. Apparently CyberGhost did receive demands from the German authorities to hand over user information, but thanks to their no logs policy they had nothing with which to comply. Top marks. Registration took a matter of seconds, and no personal information whatsoever was requested. The installation process was as simple and uneventful as you could wish for, but a Flash guide explaining the steps which appeared in the browser download page was a nice touch. Even nicer was the offer of one month’s free Premium VPN membership! This is not mentioned on the website, and therefore came as a complete surprise. We like surprises like that, and this is by far the most generous free VPN trial we have yet encountered. On logging-on for the first time (and whenever reconnecting) we were presented with an advert for CyberGhost’s Premium services. Similar adverts also pop up every two hours you are logged on to the service, but they can be dismissed after a few seconds. We did not find them particularly intrusive and, frankly, felt this very small price to pay for a no cost VPN service. The VPN client itself is styled to match the CyberGhost website, and is similarly attractive and well laid out. As a free user you cannot choose which server to connect to, so connecting is simply a matter of hitting the big button and letting CyberGhost do the rest. Et voila! You are connected. The first time that you use the client you are warned that emails cannot be sent when using CyberGhost as an anti-spam measure. However, email accounts can be added to an exception list, so this not really a problem. An interesting and welcome addition to the CyberGhost client is the Antispy add-on module, which provides a wealth of options that give you very precise control over a large number of settings that can compromise your anonymity on the internet. The client’s Settings tab gives you plenty options for making the software work as you would like it to. On our 10 megabyte UK broadband internet connection we achieved the following results when automatically connected to a London based server. Of course, each time you connect using the free VPN service you are connected to random server, so connection speeds are likely to vary somewhat, and the results would be disappointing for a paid service. However, for a free service they were in our view quite impressive, being easily plenty fast enough for casual anonymous web surfing, and more than double the supposed cap quoted on the CyberGhost website. Taking advantage of the free one month trial, we took a look at CyberVPN’s Premium VPN service. The client is of course the same one, but we could now choose to connect to any of the Premium VPN servers. CyberVPN even provide a pretty server map to reassure you that you are indeed connected as you should be. The Video Portal is, to be honest, an unnecessary gimmick that provides links to a very limited number of popular TV shows via their broadcaster’s web TV portals. This is nothing that simply visiting the relevant web portals yourself could not do, but at least does no harm and doesn’t get in the way of the otherwise excellent service. Instructions and relevant configuration files are provided for using CyberGhost OpenVPN with iOS, Linux, OSX and Android. The instructions for Android require that the device be rooted, so we did not perform our usual tests, although we imagine that configuring OpenVPN for Android would work just fine. In addition to this, configuring Android, iOS, etc. to work using the PPTP protocol (only available to Premium or Premium Plus customers) should be straight forward enough, although instructions are not provided. The tutorials that are provided appear easy to follow, although they are not accompanied by screenshots. GhostVPN are nice enough to offer a free Web Proxy service. Although nowhere near as fast, good at protecting privacy, or handing complex webpages (we could not get YouTube to work for example), it is quick and dirty way surf the web anonymously. The main real problem with the Web Proxy service is why on Earth would you want to use it when the free VPN offered by CyberGhost is so good? To be honest, we absolutely loved using CyberGhost, and struggle to find a valid criticism of it. The free service provides an outstanding experience, with minimal advertising and better than expected speed test results, while the Premium VPN service expands upon this to give great speed test results and an overall excellent user experience. We think that reserving 256-bit OpenVPN encryption for Premium Plus customers is a fair decision given how much is provided for free. Given that the basic Premium VPN service come with an immensely generous 1 month free trial, can think of little reason not to give it a try. The only real caveat comes from this being a primarily Europe based service. Of the 54 Premium VPN servers, only 5 are located outside Europe, and those in the US. Asian and other users worldwide will suffer slower connection speeds due to the distances involved, but may still find this service valuable thanks to the high level of anonymity afforded by CyberGhost not keeping any logs and user details.